Torco HiVis ATF Automatic Transmission Fluid is specially engineered for severe operating conditions encountered in racing, highway and off highway use. HiVis ATF is formulated using 100% synthetic base oils and additive technologies designed to manage extreme loads, high operating temperatures and high speed conditions. 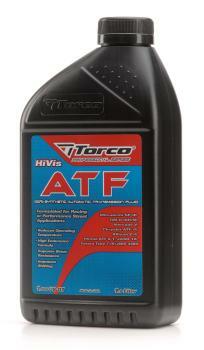 Torco HiVis ATF is a multifunctional fluid for automatic and powershift transmissions offering superior shear resistance, extreme gear protection and clean operation for extended component durability and clutch performance. HiVis ATF will significantly reduce operating temperatures.